"Boy Scout Troop #254 Official Website"
Troop #254 news and pictures will be added as they become available. Jeff Stange photo - Click for larger view. 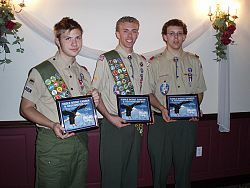 Thursday, May 10, 2007 . . . Three Eagle Scouts from Boy Scout Troop 254 were honored at a Recognition Dinner held at Michael’s Banquet Hall in Hamburg. Jeffrey Stange (1/06), Andrew Stange (2/06) and Joshua Camizzi (11/06) all accomplished Eagle Scout Rank during 2006. 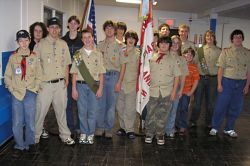 Troop 254, under the direction of Scoutmaster James McDonnell, attained the distinct honor of having the greatest number of Eagle Scouts from an Island Troop during the calendar year. The group meets weekly at the Grand Island Nike Base. Jeff serves as an Assistant Scoutmaster, Andrew as Senior Patrol Leader and Josh as a Troop Committeeman. The Recognition Dinner was sponsored by the Greater Niagara Frontier Council and local corporations. Kevin O’Connell, WGRZ, Chief Weather Anchor, himself an Eagle Scout, was featured as the keynote speaker. Photo by Jeff Stange, Assistant Scoutmaster, Troop 254 - Click for larger view. Boy Scouts from Troop 254 braved the cold temperatures February 9-11, 2007 to spend the weekend at Camp Stonehaven in Sanborn, NY. The highlight of the camping trip was hiking to “Frankenstein’s Castle” near Quarry Lake to explore the ruins of this local historic landmark. 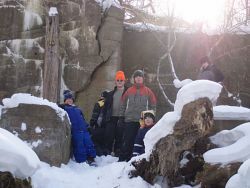 This was the second winter camping experience for the troop this year. The scouts have become proficient at dealing with the elements, creating tasty camp meals and having a good time. Click for "More Camp Stonehaven Photos" by Assistant Scoutmaster Jeff Stange. Members of Troop 254 shown from left are Evan Shaw, Kevin Neary and Ian Rogers - Click for larger view. 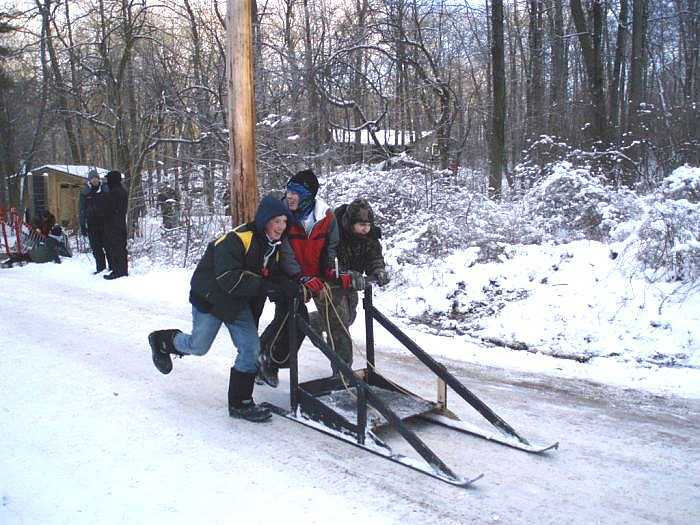 Boy Scout Troop 254 joined Northern District, Greater Niagara Frontier Council troops in Klondike competition January 19-21, 2007 at Camp Stonehaven in Sanborn, NY. In Patrol constructed sleds, the scouts traveled between interactive stations throughout the campsite demonstrating their knowledge in winter camping skills including building fires without matches, wilderness first aid and water purification. 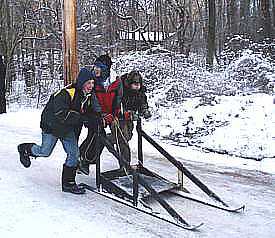 The Klondike Derby is an annual event that prepares scouts to become self sufficient in extreme winter camping environments. 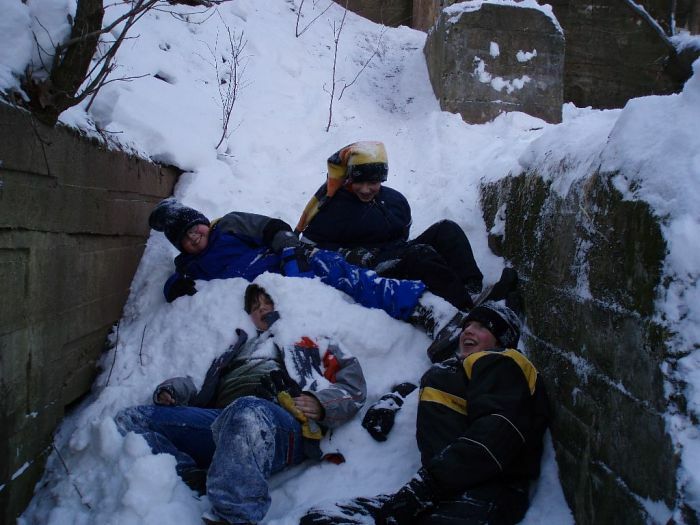 Click for "More Klondike Photos" by Assistant Scoutmaster Jeff Stange. Sorting of all those donated coins from the Halloween Trick-or-Treat for UNICEF took place at the Nike Base on Sunday evening, November 12. 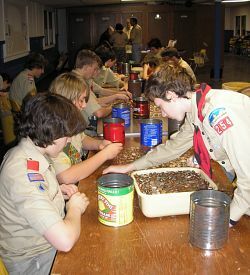 For the 28th year Boy Scouts of Troop 254 efficiently tore open hundreds of those little orange boxes and organized themselves, finally filling many HSBC bags with sorted coins. With friendly cooperation from Mike Samland and his staff at HSBC these have been sent to the main bank downtown for counting. Results will be published soon. Hal Pierce, Scout Council Advisor, never fails to plan this important, annual event. Lee Tetkowski, with competent help from Jerry Page, chaired the total Island event again. They thank everyone in our generous community for their support. Special thanks to Kathy Fik of Kaegebein l, Jennifer Kropidlowski of Huth Road, Lani Black of Sidway, and Sarah Bifaro of Middle School, who made up the teacher leaders for our schools. Since Halloween evening was rainy and followed the big October storm, fewer children were out collecting. Your donations are needed. Send your check made out to U. S. Committee for UNICEF to Lee Tetkowski at 1530 Whitehaven Rd. to be included in our total contribution. A nickel may not seem like a lot of money…but it could be enough to save the life of a child. It has been a busy summer for the Boy Scouts of Troop 254. Many of the scouts spent a week at Camp Schoellkopf located in Cowlesville, Wyoming County, NY. The week was full of activities, and many of the scouts earned multiple Merit Badges. Troop 254 recently went White Water Rafting on the Salmon River in Pulaski, NY. 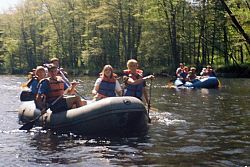 After camping the night before, the scouts and many of their parents enjoyed the three-hour ride on the river. 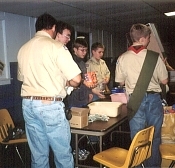 The troop was also involved in many community service projects. Troop 254 meets Sunday nights between 6:30 p.m. and 8 p.m., at the Nike Base, 3278 Whitehaven Rd. Boys 11 and up are encouraged to attend a meeting to learn more about the Boy Scouts. No prior scouting experience is necessary. Andrew Stange, 14, has received his Eagle Scout rank from the National Office of the Boy Scouts of America. Andrew is the assistant senior patrol leader of Troop #254, sponsored by the Island Presbyterian Church and is a freshman at Grand Island High School. 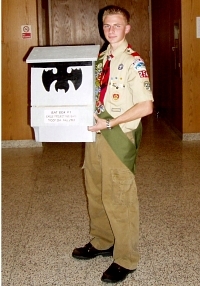 His Eagle Scout Leadership Project involved the construction of "fox boxes" for Fox Wood Wildlife Rescue in East Concord, NY. Fox Wood is a Wildlife Rehabilitation facility, education center and sanctuary dedicated to rescuing and rehabilitating New York State wildlife. Its main goal is to rehabilitate injured and ill wildlife and return them to the wild. It is also one of the few wildlife centers in New York State licensed to handle Rabies Vector Species. Andrew is the son of Richard and Christine Stange of East River Road. He is an active member of St. Mary of the Cataract RC Church, Niagara Falls and president of the freshman class at Grand Island High School. He is co-chairman of the Hurricane Katrina Relief Drive committed to providing continued relief services to hurricane victims in New Orleans. Andrew has earned his Boy Scout Lifeguard Certification and 41 merit badges with a strong emphasis on waterfront activities. He has completed Greater Niagara Frontier Council Provisional Leadership Training and plans to be employed as a waterfront counselor at Boy Scout Camp Schoellkopf this summer. Andrew actively participates in Student Council, the high school choir, vocal jazz, The Dominant Force, Men's Choir, concert band, jazz band and musical theater. He plans to pursue a college education to prepare him for a law career dedicated to public service. Jeffrey Stange, 17, of Troop #254 was recently awarded the rank of Eagle Scout by the National Office of the Boy Scouts of America. In completing his Eagle Scout Leadership Project, Jeff led his project team through a multi phase endeavor to benefit the citizens of Grand Island. Responsibilities of the project included assisting with the Town Hall Server Upgrade, including hardware and software installation, network connection, file transfer and database startup for server applications. An inventory of the town’s computer equipment storage area was accomplished, spare parts tested and labeled and unsalvageable equipment prepared for appropriate disposal. A spreadsheet inventory of usable equipment was finalized and entered into town record. The nonfunctioning public access PC received needed service through reformatting the hard drive, installing OS, loading Microsoft Office and securing connection to the network. The final phase of the project entailed providing the Golden Age Center with six functioning PC’s for the town’s senior citizens. After assessing the majority of equipment on site as unsalvageable, Jeff successfully pursued donation of viable, used computer equipment that was serviced and installed at the Golden Age Center. His Eagle Scout Project provided 242 hours of volunteer effort to the Town of Grand Island. Jeff is the son of Richard and Christine Stange of Grand Island and a senior at Grand Island High School. He is the recipient of the Baden Powell Leadership Award, the InfoTech Niagara Scholarship Award and a representative for the US Robotics Team Competition. He is an active member of the Grand Island High School Chorus, Concert Choir, Vocal Jazz, Madrigals and Dominant Force; Men’s Choir. Jeff plans to attend college as a Computer Technology major in the fall. Boy Scouts Of America Executive, Christopher Smith, will present a Youth Protection Training opportunity for Parents and Youth on Grand Island 7 p.m. Monday April 3, 2006 at Island Presbyterian Church, 1822 Huth Road. Nationwide, April is National Child Abuse Prevention Month, and for the sixth consecutive year, the BSA has designated April as Youth Protection Month for councils, units, families, and community organizations. Greater Niagara Falls Council along with countless other councils will conduct youth protection training for more than four million youth and adults. Many councils will also provide this training, through BSA videos and DVD's, books, and an Internet course, as a community service to other youth-serving agencies. "The Boy Scouts of America advocates parents becoming actively involved with their children," said Roy L. Williams, BSA Chief Scout Executive. "Scouting stresses the importance of parents having ongoing communication with their children. I know that this may be difficult, especially for working parents and parents with adolescents, but it is worthwhile to talk to your children every day and take time to listen and observe. It may be the most important contribution you make in the life of your child." Island Presbyterian Church is the chartering organization for Boy Scout Troop 254 and the newly formed Venture Crew 254 for young men and women ages 14-20 who have an interest in high adventure. Together with the BSA, Island Presbyterian Church would like to extend an open invitation to all youth, parents and adults who have an interest in protecting our youth to attend a Youth Protection Training Event Monday, April 3, 2006 at 7 p.m.
Island Presbyterian Church is located at 1822 Huth Road, Grand Island, just across from Huth Road School. Troop #254 Still Collecting - Can You Help? 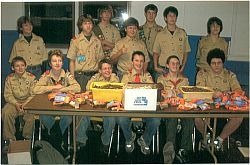 The Boy Scouts of Troop #254 recently collected and sent over a hundred pounds of supplies to New Orleans to benefit the victims of Hurricane Katrina. Jeff and Andrew Stange, Senior Patrol Leader and Assistant Senior Patrol Leader, chaired the collection drive. Pictured in the photo are: Andrew Stange, James McDonnell, Jordan Dixon, Ian Rogers, Josh Kahn, Conor Bryan and Kevin Neary. Buffalo native, Father Tony Rigioli, has been the scouts' contact person, receiving supplies for distribution to the hardest hit areas of New Orleans. Father Tony has conveyed that as displaced citizens' return to salvage what is left of their homes, there is a continued need for essential supplies. 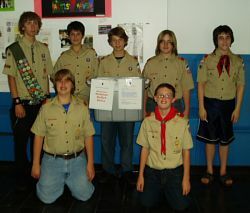 The scouts would therefore like to extend their collection drive to the Grand Island community. A Katrina Collection Box will be placed in the IsledeGrande Office located at 1871 Whitehaven Road to receive donations from the community. Pick-up may also be arranged by calling 773-6460. The items most needed and economical to ship are ALL SIZES OF NEW SOCKS AND UNDERWEAR, as well as new T-shirts, sweatshirts and sweatpants for both adults and children and would also be most welcomed. The troop would like to express its gratitude to Astellas Pharmaceutical Company for donating shipping boxes for their drive. Troop #254 is sponsored by the Island Presbyterian Church. 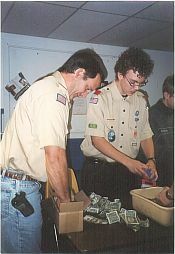 The crumpled dollar bills were carefully dumped out of the orange UNICEF cartons along with the tinkling coins on Sunday evening, November 13, 2005 at the annual UNICEF night for Boy Scout Troop 254. This year the pile of paper money yielded 415 dollar bills, 22 five dollar bills, 6 ten dollar bills, one generous 20 dollar bill and a check! Ten very heavy bank bags were filled with uncounted coins, which have been taken to the Grand island HSBC Bank to be transported to the branch’s downtown automatic counter. In addition, the teachers of Huth Road Elementary School raised $350 for UNICEF at their dress-down day! As soon as the total is known it will be published. This year 50% will go to families suffering from Hurricane Katrina. Penny by penny for the past 55 years, millions of American students, schools, parents and partner organizations involved in the United Nations Children’s Fund (UNICEF) have raised more than $127 million to assist and support children in developing countries. Grand Island has never stopped participating! “Thanks to all the children who did the collecting, to all the Grand Islanders who responded generously, to the teachers who provided the motivation and understanding, to the Boy Scouts who did the heavy work, and thanks for the support of our town, banks, and places of business!” said long-time chairperson, Lee Tetkowski. Fridays at the M & T Bank, November 18 and 25, from 10:15 a.m. to 5 p.m.
Wednesdays at Town Hall, November 30, December 7, 10 a.m. to 3 p.m. Contributions made out to U.S. Fund for UNICEF and mailed to Lee at 1530 Whitehaven Rd. can still be added to our Grand Island total. 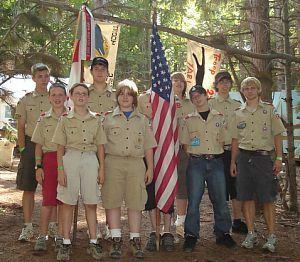 Boy Scouts of Troop 254 are Chris Brownschidle, Josh Camizzi, Jordan Dixon, Matt Foote, Ian Johnson, Joshua Kahn, James McDonnell, Thomas McDonnell, David McMichael, Kevin Neary, Corey Price, Scott Quider, Evan Shaw, Ben Sherman, Ben Smith, Drew Stange, Jeff Stange. Adult leaders are Scoutmaster Jim McDonnell, Assistant Scoutmaster Tim Szczykutowicz and Council Explorer Advisor Hal Pierce. UNICEF leaders are Grand Island UNICEF Chair Lee Tetkowski and Assistant Island UNICEF Chair Jerrie Page. Boy Scout Troop 254 will kick off its 2005-2006 year of scouting at 6:30 p.m. Sunday, September 11, 2005 at the Nike Base, 3278 Whitehaven Road. Any boy between the ages of 11-18 (grades 6-12) interested in scouting is invited to attend with a parent/guardian. No prior scouting experience is required. Refreshments, games, and an overview of upcoming events are planned. Call Scoutmaster Jim McDonnell (773-4593) or Dennis McMichael (774-8761) for more details. Andrew Stange, an Eagle Scout candidate with Boy Scout Troop #254 and a freshman at Grand Island High School, participated in the Greater Niagara Frontier Council Senior Provisional Leadership Program at Camp Schoellkopf in Wyoming County this summer. The Program provides scouts with hands on experience necessary to serve as a summer camp counselor. Andrew has earned his BSA Lifeguard Certification as well as merit badges in Swimming, Lifesaving, Small Boat Sailing, Motor Boating, Rowing and Canoeing. He hopes to be employed as a waterfront counselor next summer. Timothy Szczykutowicz of Boy Scout Troop 254 was recently recognized as an Eagle Scout, the highest rank achievable in scouting. 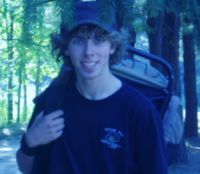 For his Eagle service project, Tim coordinated the reconditioning of the nature trail at Buckhorn Park in early October of 2003. Tim directed his troop in the trimming of stray branches, shrub removal, filling in holes and resurfacing much of the path. A senior at Grand Island High School, Tim is a member of the National Honor Society, runs Varsity Cross Country and Track, and is captain of the Swim Team. He is currently serving as an Assistant Scoutmaster for Troop 254. Robert Goris, shown with County Legislator Chuck Swanick, was recognized as an Eagle Scout on Sunday, March 7, 2004 in Island Presbyterian Church. Click photos for larger view. Robert Goris, a junior at Grand Island High School and a member of Boy Scout Troop 254, has achieved the rank of Eagle Scout. Robert's Eagle project consisted of building and staining ten bat houses, to be placed throughout the community as a method of mosquito control. He organized and supervised fellow scouts during the construction of the bat houses, which were then presented to the Grand Island Recreation Department. The son of Dave and Sally Goris, Rob has been involved in scouting for 11 years. Under the leadership of Hal Pierce, members of Boy Scout Troop #254, for a total of 25 consecutive years, have participated in the sorting of coins collected on Grand Island for UNICEF. UNICEF Chairman Lee Tetkowski, who continues to serve, has been the driving force for the UNICEF campaign on the Island for about 50 years. Connor Bryan, Josh Camizzi, Rob Goris, Joshua Kahn, Kenny Martina, James McDonnell, Thomas McDonnell, Travis McGilveary, David McMichael, Scott Quider, Andrew Rogers, Drew Stange, Jeff Stange and Tim Szczykutowicz. 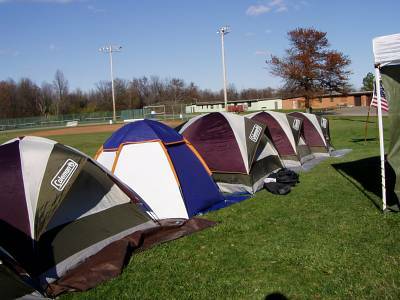 Boy Scout troops 254 and 510 of Grand Island held their first all Island Camporee from November 7-9, 2003. The scouts and their leaders spent the weekend camped out at the Nike Base, where they participated in First Aid, Orienteering, and Campfire building competitions, as well as an open air viewing of the lunar eclipse. The Camporee was a great success and is planned to be an annual event for Island Scouts. 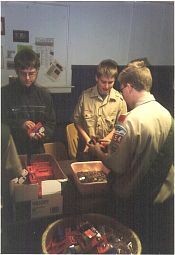 Boy Scout Troop 254 welcomed four new scouts into the troop on May 16, 2003. After receiving their Arrow of Light Award, Travis McGilveary, Kodie Shamrock, Kenneth Martino, and Thomas McDonnell officially crossed over and became members of Troop 254. Pictured in the front row are the new Boy Scouts. 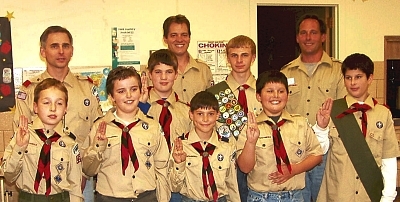 Also shown (middle row) are Troop 254 Scoutmaster Dave Goris, 2nd Class Scout David McMichael, Eagle Scout candidate Rob Goris and Second Class Scout James McDonnell; (top) Pack 254 Cubmasters John Boulden and Jim McDonnell. Boy Scout Troop 254 is sponsoring a Red Cross Adult/Infant/Child CPR Certification course for all interested Grand Islanders. Boy Scout Adult Troop leadership, Boy Scouts, lifeguards, parents, and anyone working with youth are welcome to enroll in this course. It will run on Wednesday, December 4, 2002, from 6:15 -9:15 p.m. at Kaegebein Elementary school cafeteria 2, and Dec 10 and 17 at the Grand Island High Sschool senior cafeteria (same times). The cost is $40, payable to the instructor the first night of class. If interested, contact Barbara McMichael at 774-8761 or dennismcm@adelphia.net no later than Sunday, December 1, 2002. Copyright © 1995-2007 All rights reserved.